Slime is so inviting and calming. It’s a play recipe I’ve used for years with my preschool classes and my own children. 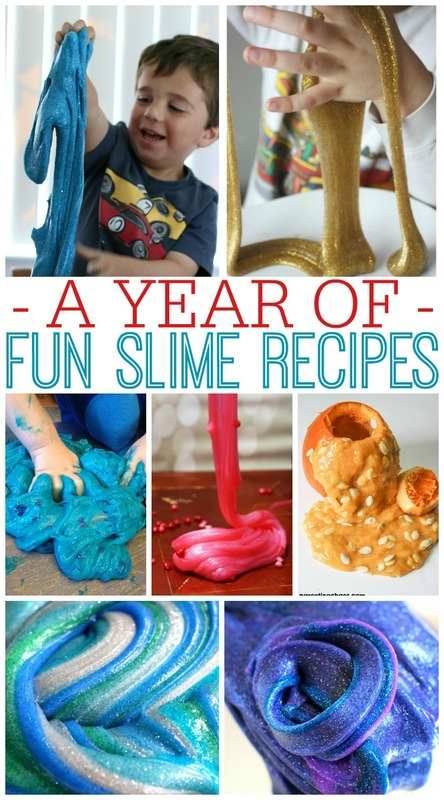 We love to make new slime recipes for holidays, seasons, and themes. And now I’ve compiled some of the absolute best slime recipes. 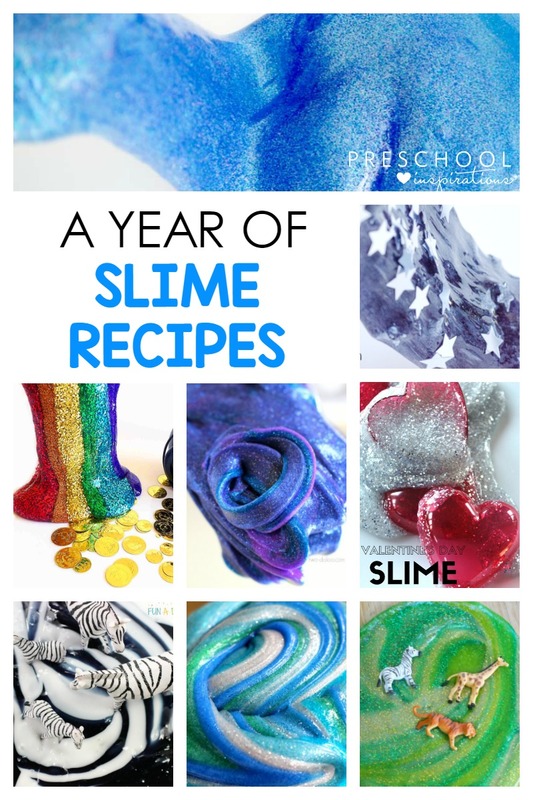 Here is a year of slime recipes that you and your children or class can explore together. These slime recipes are awesome and all made of different components, and you can feel free to choose your favorite slime recipe and just add the “mix-ins” from the ideas below. As with all play recipes, supervision is needed. Slime is formed from chemical reactions. Do not make slime with children who may want to eat it. If you want a recipe that works time and time again, here is my perfect slime recipe. It also explains how to fix slime that is too hard or too sticky! It is the gorgeous blue slime pictured below in the collage. My favorite glue to use is Elmer’s clear glue because it works the first time, and it gives the best color (in my opinion of course)! Party Slime | Left Brain Craft Brain If you have a slime girl or slime boy, have you thought about having a slime party? This party slime is an absolute must! It is so full of colors and shine, it will be a hit for sure! Silver & Gold Slime | Fun-a-Day This Silver and Gold Slime makes me thing of a king and a queen. Let your little ones feel like royalty for a day with this super shimmery slime. Sparkling Party Slime | Little Bins for Little Hands New Years Eve is a holiday that is typically full of glitz and glam, shimmer and shine. This Sparkling Party Slime recipe is absolutely perfect for New Years Eve party! Red Hots are one of my favorite Valentine candies. They sizzle when they hit your tongue just like this Red Hots Slime will when you make it with your kids for a fabulous sensory activity! Often we give candy along side Valentine cards, but you don’t have to. Insert plastic heart containers full of Silvery Valentine’s Day Slime and it makes the perfect slimey gift! You can easily convert a slime recipe into a Valentine’s day theme by adding super fun and sweet heart confetti. How fun is this slime? I love how this pink slime is used with cookie cutters to make sparkly hearts for Valentine’s Day. Slime is fun but glitter slime is absolutely mesmerizing. If you have a glitter lover, they will love this Valentine’s Day glitter slime! Confetti is a perfect addition to slime as that can be seen in this sparkly Valentine’s Day slime. This would be a wonderful extra to go with a Valentine’s Card! This Leprechaun Slime is full of sparkle, shine and gold. Your little leprechauns will love this sensory activity! Slime can be unbelievably calming for any day of the year, but this one is perfect for St. Patrick’s Day! Gold is a symbol of luck for St. Patrick’s Day and this gold slime will make kids feel lucky as can be. A pot of gold coins is nice, but a pot of gold slime is even better. This would be the perfect treat from a leprechaun! Gold and Green are the fabulous colors of St. Patrick’s Day. 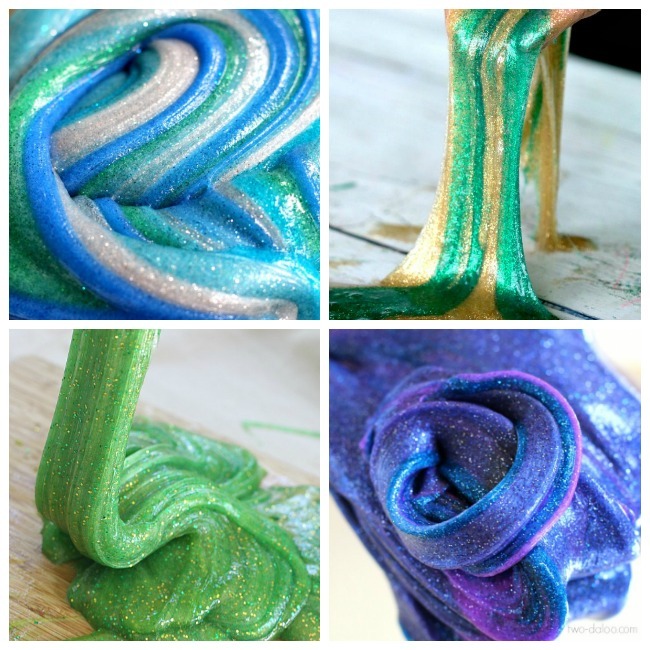 This slime is chalked full of festive sequins that shine and make this sensory activity even more eye catching! Rainbows are iconic for St. Patrick’s Day. This rainbow slime is not only sparkly but the colors are incredibly rich and beautiful. This rainbow slime looks like the perfect sensory play. These colors and this slime make me want to squeeze it and let it ooze out my fingers! I love how this colorful rainbow slime is also slightly translucent. This makes for a totally different experience than other slime recipes. Did you know that slime can sometimes be made with only one ingredient? This Rainbow Slime Recipe is looks so fun to make! Another fun way to switch up a slime sensory activity is to add large pieces to the slime. In this recipe, the add in is big chunky Easter eggs which looks incredibly fun! Peeps are a delicious treat, but they also can make a fun sensory activity. I love that the texture looks different than most slime recipes too! You don’t always have to mix anything in to give slime a theme. This fun chick slime may look like typical slime until you put it in a jar dressed as a chick! Fourth of July is a holiday full of shiny stars and this Fourth of July Slime Recipe is no different. This slime screams Star Spangled Banner! Red White and Blue are the core of this slime that reminds me of fireworks on an Independence Day night! This 4th of July slime recipe looks so fun and resembles the American flag with a little touch of sparkle! We already know that the inside of a pumpkin is slimey and gooey and this sensory play is no different. Once you add the seeds, will you even be able to tell the difference? Spiders are quintessential Halloween spook. This slime is anything but spooky, unless you want it to be. I love that the slime it self takes on the aspect of the spider webs while the plastic spiders climb through! Pumpkin guts are always slimey but they get even slimier when you add them to a traditional slime recipe. This is perfect for sensory loving kids! If your kids love creepy crawly bugs, this slime is for them! It is easy to make and the perfect way to fill up your bug loving kids’ bucket! This is the coolest ghost I have ever seen! Plus it is absolutely SO easy to make slime into ghost slime! This is a fun invitation to create with slime activity. Kids will enjoy the sensory aspect with the slime, but with all the extra goodies they will be creating gingerbread men over and over! Peppermint is my favorite flavor and scent for the weeks surrounding Christmas. Even kids who are not typically interested in messy play loved this Peppermint slime recipe. If you walk the streets during the Christmas season you are bound to see at least a few candy canes. This slime mimics this fun Christmas symbol and is the perfect way to add festiveness to your sensory play! Slime is an inexpensive way to incorporate a Christmas theme into messy play! This slime recipe includes fun Christmas themed confetti glitter and it looks FUN! Playing in the snow is fun, but some kids don’t like being cold so this slime recipe is the perfect way to get fun hands on winter play without having to be outside! The texture of this snow slime is the perfect addition to a arctic animal sensory bin. Bring the cold weather animal friends and let your kids play with their imagination and this ‘snow’. Did you know that slime will freeze? I did not and from the looks of this it is one activity that I need to try ASAP! I love the different colors and textures that each part of this slime activity have. This is an excellent activity to encourage children to learn the different areas of the Arctic! Have you seen snow fall in the moonlight? It literally looks like glitter is falling from the sky. This slime activity reminds me of that exactly. How fun! The ocean is a vast, shiny place that is full of fun creatures. This slime activity is perfect for studying ocean animals because I can’t think of anything better than having slime play the ocean! Your little mermaids will LOVE this slime. The colors and sparkle are just like a mermaid tail and the confetti is such fun shapes there is no doubt you’ll have smiling mermaids in no time! There are many activities that can help teach about color mixing but this slime has got to be one of the most fun! This is a fabulous sensory activity to help teach about color theory! Do you have a unicorn lover? The colors of this Unicorn Snot is so bright and the sparkles are so fun. It might even turn us all into unicorns! Slime inside slime? YES! This sensory play is an experience all in itself. There is colors and white, stretchy slime and balls of slime. This is pure awesomeness! Are you studying jungle animals? This slime recipe looks like it came straight from the jungle floor and is the perfect ‘home’ for jungle animal friends. I love how this slime recipe actually looks like zebra stripes. It is super easy to put together but kids will love how real it seems to be! Frog eggs are tiny and in a big bunch together. This slime, with just a little extra prep, makes slime that looks exactly like frog eggs and it is AWESOME! Astronomy is a fascinating part of STEM. This night sky slime recipe looks like it came straight from the sky. The stars sparkle as bright as the real thing! This Nebula slime recipe is completely fascinating. It is so sparkly and colorful that it will no doubt be a hit!